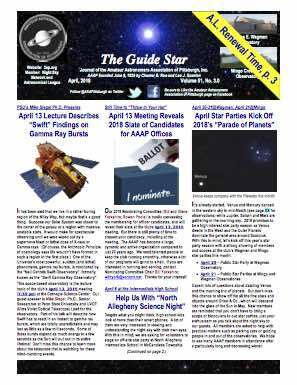 Plan Ahead for 2018 Wagman Observatory Star Party Dates: The Star Parties will be held WEATHER PERMITTING. The public should call 724-224-2510 for more information. The Nicholas E. Wagman Observatory, owned and operated by the Amateur Astronomers Association of Pittsburgh is located in Deer Lakes Regional Park, Frazer Township, Pa., near the village of Russellton in northeastern Allegheny County and some 18 miles from Pittsburgh. Coordinates: Latitude 40.627 degrees N, Longitude 79.813 degrees W. Map and Directions under the About Tab at www.3ap.org and here.